Gavin Blair and his family run a 400 ewe flock and 80 suckler and beef herd near Moneymore. The flock consists of mule ewes put to Suffolk and Texel rams. Lambing takes place from February to April. When ewes and lambs are on the ground from spring to summer the number of sheep per acre becomes very high. With grass now growing quickly there is a much higher risk of scald and this can also lead to foot rot. Lameness control starts when sheep go into the house, where they are all run through the footbath and any individual treatments needed are done. This is repeated after lambing and at all other handling times – on average they are footbathed every 2 to 4 weeks during spring and summer. Gavin also puts straw in the bath at the start of the year and when footbathing sheep for the first time. This breaks the reflection so they are calmer going through it. 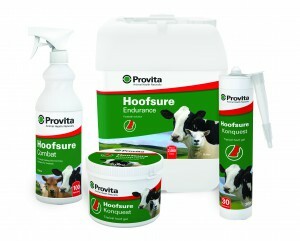 Hoofsure Endurance footbath solution is a propriety blend of organics acids, essential oils and wetting agents. Hoofsure Konquest Hoof Gel is highly concentrated with potent penetrating action. It also has advanced bio-adhesion properties and can be used with or without a hoof bandage. Hoofsure Combat Hoof Spray is a unique film-forming spray providing persistent longer lasting activity.